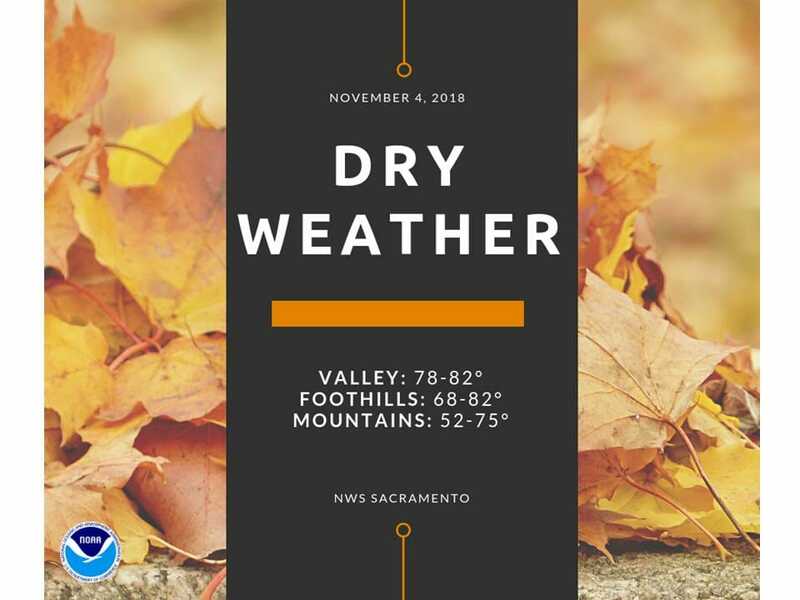 November 4, 2018 – Dry with warmer than normal temperatures and periods of breezy winds through the week. Dry northwesterly flow aloft will prevail across interior NorCal as high pressure remains over the eastern Pacific. A weak system moving north of the area will bring periods of clouds today. Behind this system, another round of northerly winds is anticipated Monday afternoon into early Tuesday, but these winds are not expected to be overly strong. A shortwave disturbance will drop into the Great Basin by midweek, resulting in breezy winds and increasing fire weather concerns. Sunday highs will be mostly in the upper 70s to low 80s across the Valley, with mid 50s to mid 70s over the mountains. Daytime temperatures will gradually cool heading into midweek, with Valley highs in the 70s. However, daytime highs will still remain 5 to 11 degrees above normal for early November. No precipitation is expected through the period. Strong high pressure over the western U.S will dominate the weather pattern through the extended period. Daytime highs will come in a few to several degrees above normal each day while fair skies allow overnight lows to come in a little below normal. A weather disturbance dropping through the Pacific Northwest and into the Great Basin mid week will result in breezy north winds on Thursday. This combined with low humidity will bring another round of increased fire danger especially west side of the Sacramento valley and coast range and over the Sierra. Pressure gradients relax on Friday for lighter winds Friday through next weekend but humidity remains low so fire concerns continue. Next articleCaltrans Sierra Roadwork Schedule through Saturday, Nov. 10, 2018.